this time its also from the ending cause i loved how Tear looked there. vector was done in 6 hours. i decided to make not equivalent lines, cause i saw one of erderbemich works. you can say i was inspired by erd-chan. This is definitely one of your best jobs, at least for me:D the vector is beautiful, sooooo many cloversXD and the flowers are beautiful. also i love the clouds they are gorgeous, and everything is amazing! i also love neatness of the vector. omg, this is just beautifull! I really like it! What a stunning wallpaper! Such a beautiful scene with Tear in a field of flowers and clovers. The vector looks superb and perfect. I really love how you did the clouds, they look so well made and not odd looking. The sky looks wonderful too with the shades of blue. I love the view... I love the vector... I love BUTTERFLY!.... I LOVE ALL~~~! and the mountains as well, good perspective and nice distance. I've been waiting for a Tear wallpaper and you have granted my wish. this wall' is amazing! nice color! thanks for sharing! I love the bg, it looks so peaceful! 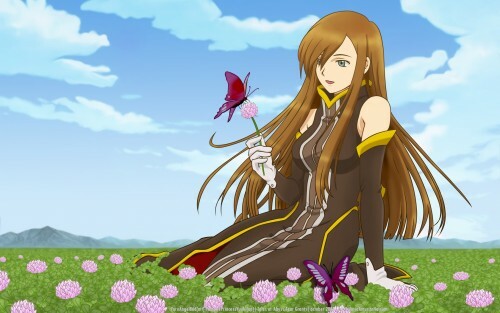 I adore Tales of Abyss. <3 It`s awsome that there`s more walls of it now. The scenery on the background is really pretty. I definitely like the flowers the most. And looky, butterflies. I`m totally adoring your bright scenic walls. Gorgeous!You made a very beautiful wallpaper! You must made it very hard! Such a beautiful wallpaper. It so serene. Great job!